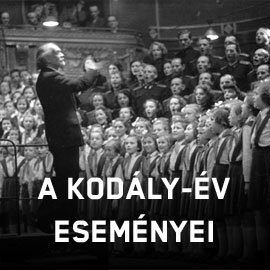 The Kodály anniversary event in Kecskemét was organized at the Kodály Institute on 16 December. Dr Andrea Vigh, rector of the Liszt Ferenc University of Music and Klaudia Szemerey-Pataki, mayor of the town, announced the launch of the Institute's infrastructural development and expansion project. The month of December was full of musical events. Students of the Institute gave concerts, and in open classes they demonstrated what they had learnt during the academic year. Erzsébet Szőnyi – retired leading professor of the Liszt Academy, holder of the Kossuth Prize, the Erkel Prize, the Apáczai Csere János Prize and the Bartók-Pásztory Prize, composer and music pedagogue, Artist of the Nation – decided to donate her music collection to the Kodály Institute.